Duval Paving, LLC has the skilled technicians, heavy equipment, and superior customer service to allow your decision making process and paving project to be flawless. When you're ready for your consultation on recycled asphalt millings for your project, give us a call at (904) 201-2161. We'll be happy to answer any and all questions you may have and provide you with a free estimate. Why choose recycled asphalt millings? Environmentally Friendly - Asphalt isn't biodegradable and ends up sitting in landfills. Our ability to reuse old asphalt to construction new driveways and parking lots helps keep our addition to landfills low. Creating new asphalt also causing pollution. By reusing old asphalt, we're reducing the need for new asphalt, thereby, adding fewer pollutants to our environment. Durable - Asphalt millings can withstand any type of weather, hot, cold, humid, and even extreme winters. Maintenance Free - Asphalt millings don't require resurfacing, resealing, or replacement. Affordable - Being able to use existing asphalt drastically reduces the cost of raw materials. Aesthetic - Once your project is complete, a driveway or parking lot constructed from recycled asphalt millings can be quite beautiful, adding to the curb appeal of your property. Why choose Duval Paving, LLC? 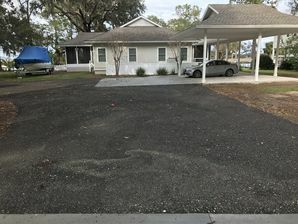 For more information on recycled asphalt millings or for a free quote for your Jacksonville area home or business, call Duval Paving, LLC at (904) 201-2161.